Hello friends! I will be hosting my first giveaway on the blog, yay! I was graciously sent a set for myself and was provided a second set to giveaway to my readers, how awesome is that?? Tis the season to indulge in all the good and not so good foods, and what better than a Spin Brush to get an extra close clean? 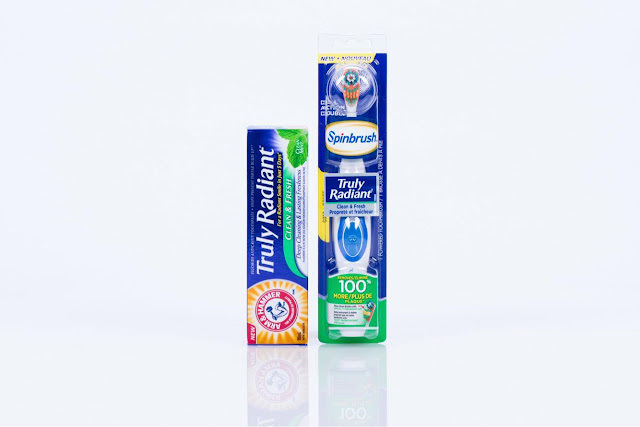 Along with the Truly Radant Spin Brush you will be receiving the Truly Radiant toothpaste! Stay tuned for giveaway details down below. Living radiantly means being confident in your own skin. The makers of Arm & Hammer are launching the newest innovations in the Truly Radiant lineup to help keep teeth feeling clean and fresh! Introducing a fresh, new cleaning sensation! Powerful whitening cleansers give teeth an amazing deep clean plus invigorating spearmint flavour or long-lasting freshness. For clean, fresh, truly radiant smile every time. Take deep cleaning to a whole new level! The latest battery powered toothbrush combines years of technology with a revolutionary design to create the ultimate brushing experience that removes 100% more plaque**. Arm & Hammer is my brand! I've never tried anything from A&H but electric toothbrushes freak me out. Just the sound of them makes me want to run away with my arms flailing in the air. I've always liked A&H toothpaste. Spin brushes are the best! I've never tried Arm & Hammer toothpaste before, but the spin brush sounds interesting! I've never tried an electric toothbrush. I probably should! I've never heard about this brand! I guess it has a different name over here or it's not distributed at all. Too bad I'm in the US! Interesting! We don't have that brand here. Arm & Hammer is literally the ONLY toothpaste brand my son will use!